Old Man Logan #36, by Ed Brisson, Dalibor Talajic, and Carlos Lopez, returns Logan, his healing factor weakened, to the Big Apple after his adventures in Japan, where he’s immediately thrown into conflict with the new mayor, Wilson Fisk. Will he be able to survive this encounter with the Kingpin? New York City has changed while Logan was gone but he still recognizes a few things, as Mayor Fisk’s crusade against costumed vigilantes reminds him of the future he came from. At a bar, he’s approached by a man named Nicky who used to work for Fisk. He has a tantalizing offer for Logan, an encrypted flash drive that could contain secrets that could sink the mayor. Fisk, however, is also searching for the man and flash drive, sending his goons to retrieve it...where they run afoul of Logan. The fight goes badly for all involved and Kingpin prepares to up the ante, setting the stage for a titanic tussle. Ed Brisson had some big shoes to fill when he came on Old Man Logan, since Jeff Lemire’s run on the book is easily in the ranks of the best Wolverine/Logan stories of all time. However, since Brisson came on the book, the quality hasn’t fallen very much. It doesn’t have the pathos and emotional resonance that Lemire’s run had (although the return of Mariko in the just finished Japan story arc was a wonderful moment for any long time Wolverine fan), but Brisson is still able to turn in great stories that touch on the character’s past while delivering the goods when it comes to plot, action and characterization. Brisson gets Logan and it shows. It’s an interesting touch for Brisson to link Fisk being mayor with the Badlands in Logan’s mind. One of the big parts of Lemire’s arc was Logan realizing that the present he was in wouldn’t necessarily lead to his future, but Fisk’s crusade against New York’s heroes has him wondering. Logan would have helped Nicky regardless, but adding this wrinkle to the whole thing, that this may be how the his future comes about in this universe, makes it more of a personal thing for Logan. Besides which, Kingpin and Logan butting heads is pretty interesting, especially with the power of the mayor’s office behind Fisk. He’s always been dangerous, but this new legitimacy and mandate from the common people makes him even more of a formidable foe. The art for this story is solid. Talajic’s style isn’t flashy, but it gets the job done. It’s a little better in close up than it is on the wide shots and the action scenes, which, while well laid out, aren’t the best looking. He nails Logan’s facial expressions in his conversations with Nicky, though. 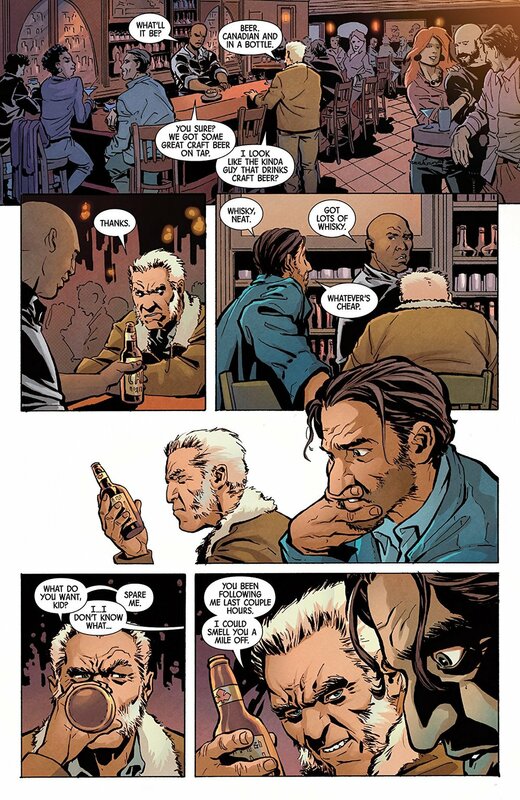 It makes the reader believe the dialogue that much more as Logan is convinced to help. Lopez’s color really make a big difference throughout the issue. He knows when to go bright and flashy and knows when to darken it up, like at the end, where his use of shadow with Fisk’s secret weapon is brilliant. It isn’t enough to hide his identity; by this point we already know who he is, but it’s like a Grim Reaper’s shroud that is fitting for a character this deadly. Old Man Logan #36 is a great start to a new story arc. The art could be a little better, but Brisson’s story is so good, if a little cliche, it still engages the reader. The whole set up for this story arc is pretty intriguing. If there is ever a weakness to Wolverine/Logan stories, it’s that they fall back on the same types of villains, usually ninjas, shadowy government agents, mutant threats, or old foes with scores to settle. Pitting Logan against the Kingpin, especially the new mayor of New York Kingpin, is an inspired choice. This isn’t a perfect book, but it’s an entertaining read with a great hook for the issues to come.